About 160 million years ago, charged particles (electrons/protons) that were inflowing toward the black hole were caught in magnetic field lines and ejected outward in the shape of a beam with high velocities. 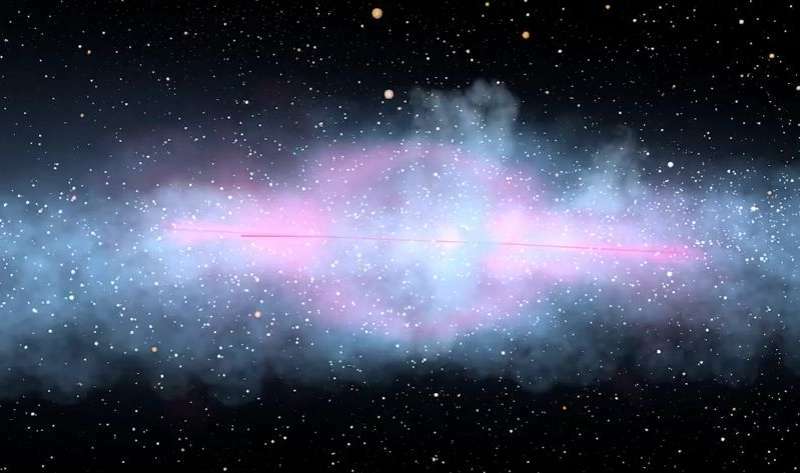 The beam of particles, also known as jet, propagated through the galaxy for more than 3000 light years. It went through a gas disk, driving strong winds at the points where it collided with interstellar clouds. The winds lasted for more than a half-million years, according to ESO Very Large Telescope data. A new study conducted by a group of astrophysicists led by Dr K. Dasyra suggests that black hole jets can affect the star formation in galaxies by both dispersing and heating large amounts of gas over large areas. The result is based on observations of the nearby galaxy IC5063, collected with the ALMA Array of the European Southern Observatory (ESO). This study was conducted following a previous discovery of multiple jet-driven winds in IC5063, which are linked to the supermassive black hole in its center (see The jet of a black hole drives multiple winds in a nearby galaxy). The scientists analyzed the ALMA data aiming to determine whether the gas in the winds has different properties than the gas in the rest of the clouds. For this purpose, they targeted emission lines of CO, originating from molecules in dense interstellar clouds, where the formation of new stars is often taking place, and where the temperature of the gas is typically ~10K. They showed that the molecular gas impacted by the black hole jet is heated, with temperatures often in the range 30K to 100K. The importance of this result lies in the impediments it poses for star formation—the increased thermal and turbulent motions of the gas delay its gravitational collapse. The gravitational collapse is further delayed by the dispersion of the clouds as the impact of the jet removes gas from dense clouds and disperses it into tenuous winds. The mass of the molecular gas in the winds is at least 2 million solar masses. Because of the energy deposited by the jet, the molecular gas is more highly excited in the winds than in the rest of the clouds. This result is encouraging for future studies in the field, as it indicates that the detection of molecular winds will be easier than previously thought for distant galaxies, which can only be observed in high excitation CO lines. Consequently, scientists can evaluate the role of the winds driven by black hole jets in the sizes of the observed galaxies over cosmological scales. This study was published in the peer-reviewed journal Astronomy & Astrophysics on November 1, 2016.